McFarlane Toys is proud to unveil the remaining two boxed sets for this fall's NFL Sports Picks series. The first -- and already announced -- boxed set features Philadelphia Eagles quarterback Donovan McNabb vs. New York Giants defensive end Michael Strahan. This NFC East rivalry-themed two-pack is scheduled to arrive in stores in early July. The next offering focuses on a different sort of competition: sibling rivalry. When Eli Manning was drafted first overall in this year's NFL draft, he received the chance to not only follow in his father Archie's footsteps, but to compete on the same level and at the same time as his older brother Peyton. The Indianapolis Colts quarterback will be featured alongside his little brother, the new QB of the future for the New York Giants. 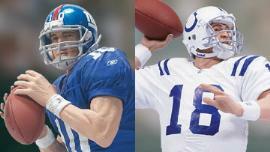 The Manning brothers will be passing your way this September. Our final NFL two-pack on the 2004 schedule zeroes in on a regional rivalry. Though the Washington Redskins and Baltimore Ravens don't share much head-to-head history on the football field, those two fan bases have spent years arguing back and forth. McFarlane Toys takes a look at those "feuding neighbors" and sets up a possible confrontation between Baltimore's fearsome linebacker Ray Lewis and Washington's newest weapon, running back Clinton Portis. This boxed set will be arriving in stores in October. Stay tuned to the News section and also our Sports message board for more information and upcoming photos of these Sports Picks sets.